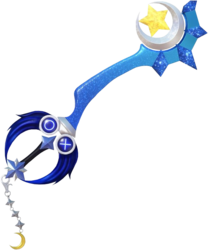 Midnight Blue is a Keychain for Sora's Keyblade in Kingdom Hearts III. Midnight Blue is a PlayStation 4-themed palette swap of Star Seeker. Its handle is black with a blue star near the blade and a silver star near the pommel. The shooting stars that comprise the guard are navy blue, with one displaying a blue button and another displaying a blue button, while on the other side displaying a blue button and another displaying a blue button. The base of the blade is silver, and the blade is blue with a pattern similar to the night sky. Set along the tip are three blue crystals, and on the teeth are a silver moon and a yellow star. The Keychain's links are silver, and the token is a yellow moon.